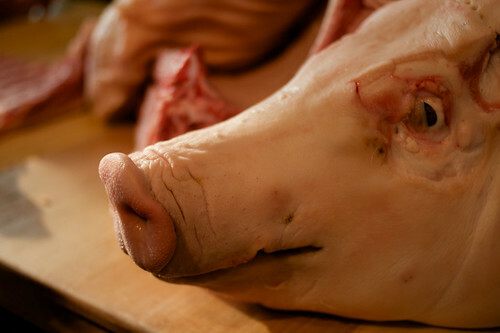 Friday night I got an email from FoodBuzz telling me that I’d won a pair of tickets to Cochon 555, two days away. I was elated. 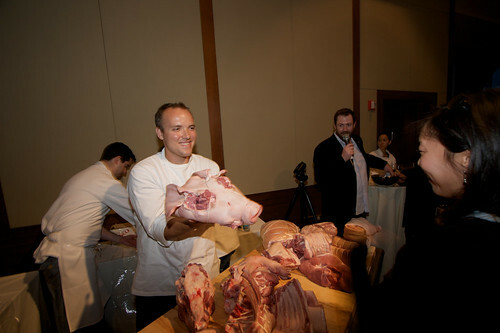 At the event, chefs from some of the best restaurants in town had their way with five 125 pound pigs and handed out the results to attendees. Yet, I only ate a couple small plates. Why? Because I’m a meat nerd and butchery awaited. 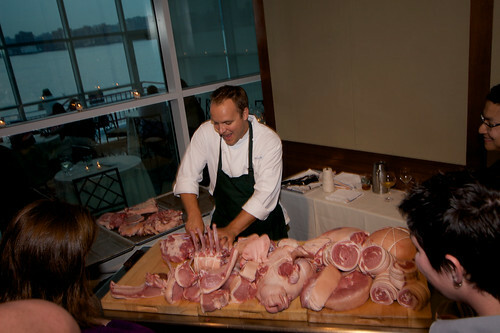 Instead of grazing all evening, I spent a couple hours in the corner watching Ryan Farr, San Francisco‘s butcher king take apart a whole pig of his own. Farr went muscle by muscle to show us cuts and techniques that I can’t wait to try at home. 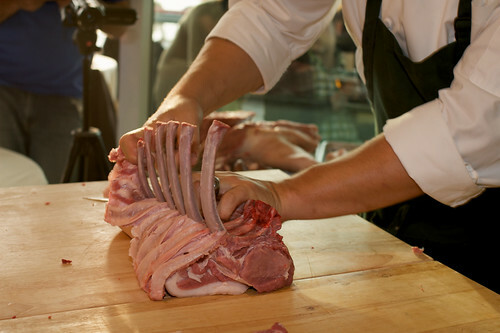 He frenched a loin rack like one would a lamb roast. I think I’d have to see that several more times to even contemplate doing something like that. Really though, the coolest part was what Farr did with the head. He deboned it, removing the skull, then he stuffed the face with shoulder meat. After that, he sewed it all up with butchers’ twine and a needle. See the slideshow after the jump for a blow by blow. 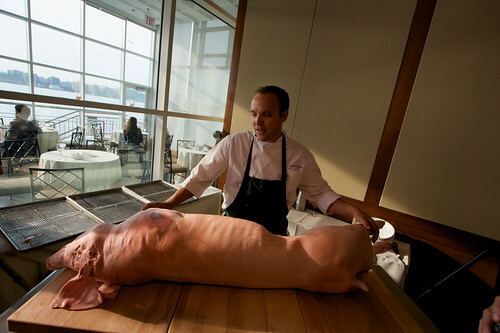 I think I’ve found my next butchering challenge. Seriously, I’ve been all about cheeks and such for ages, it’s time to graduate up to a whole head. Talking to Farr about the classes he teaches back in San Francisco, I found out that unlike the classes here in New York, his classes are completely hands-on. Before the session, I introduced myself and told him about my Butchery project. He was into the idea and told me I’d be welcome to come in to photograph a class the next time I’m in San Francisco. I’m hoping to be there over the summer at some point, so keep your fingers crossed.